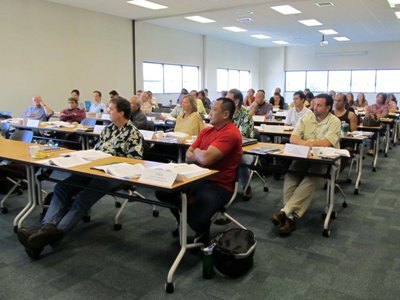 The Construction Training Center of the Pacific (CTC) is a one-stop comprehensive training and educational resource center established by the Building Industry Association of Hawai‘i as its workforce development arm. The CTC provides academic and vocational training, career counseling, job awareness, and related supportive services that address critical labor shortages in the rapidly expanding construction industry. 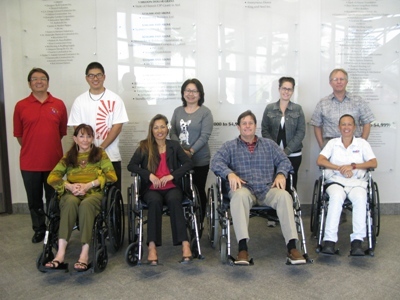 The mission of the Construction Training Center of the Pacific is to “provide education and training that supports a sustainable construction workforce in Hawai’i through career development and life-long learning programs.” Its goals are twofold: first to reach out to communities at large, women, youth, minority and disadvantaged groups; and second, to provide continuing education to the construction industry, including promotion of a safe work environment, and participation in comprehensive designation programs that promote entrepreneurship and company success. Click here for a complete list of up-coming courses. 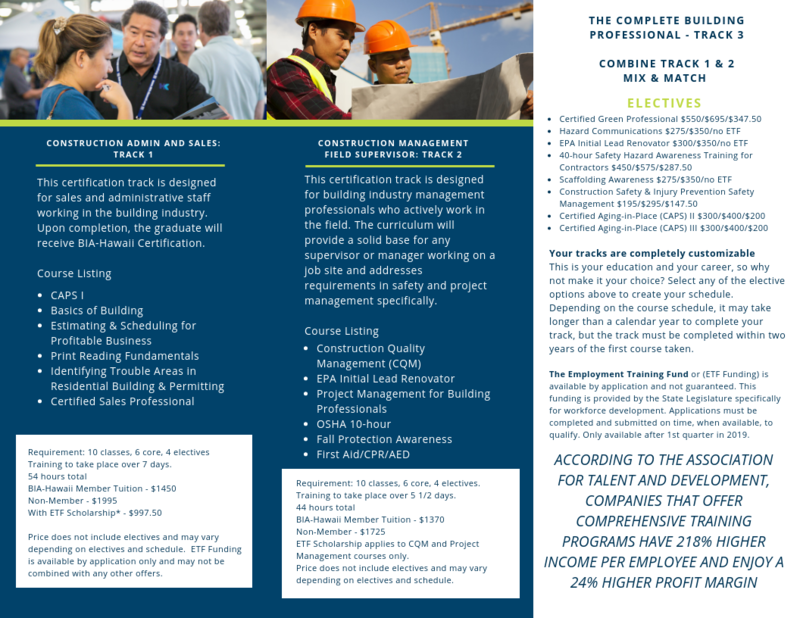 From "Construction Administration and Sales" to "Construction Management Field Supervisors and Managers", we have created the ideal training path for the building industry professional. While we provide suggested course tracks, your plan is completely customizable. Research shows that 40% of employees who don't receive necessary training, leave within their first year. We understand the challenges that you face and are here for you. Choose your track and we'll do the rest. No more frustration. We'll organize your schedule, send reminders, and track your certificates upon completion. You'll avoid unnecessary employee turnover; save time and money, and stay up to date on the latest industry updates. Are you ready to build a better career? Are you ready to build a better business? Start here. Anyone in the building industry, workers, supervisors, and employers can register for career development courses to build their skills and their businesses through the CTC’s continuing education courses. Learn about the latest technical advances in building techniques and materials, construction business management, and earn safety certifications. Industry professionals can earn nationally recognized professional designations through the National Association of Home Builders (NAHB), and the Home Builders Institute (HBI), the workforce development arm of NAHB. The CTC promotes and encourages safety and health compliance courses focused on prevention of work related injury and illness. In partnership with the American Red Cross and National Scaffold Safety Training Institute, and following Occupational Safety and Health Administration (OSHA) Standards for the construction industry, participants receive nationally recognized certificates.